Here is the list of Best Free Circuit Simulation Software For Windows. 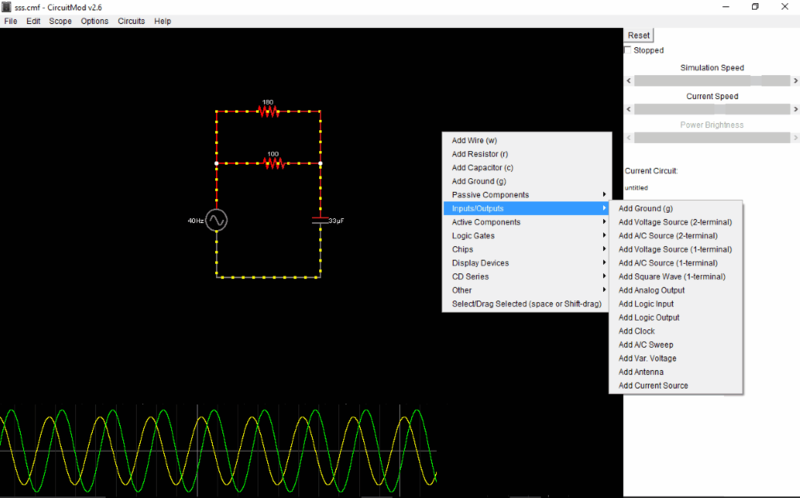 These freeware let you design as well as simulate circuits on your PC. Using these software, you can actually checkout how a circuit will behave, and also know additional information including its waveform. If you are specifically looking for Circuit Design Software, look here. There are various types of circuit simulation software that have been mentioned in the following list. Some are electric circuit simulator, some are electronic circuit simulator, some spice circuit simulator, and some power electronic circuit simulator. The simple circuit simulator listed here let you carry out only one type of circuit design and simulation, while the advanced ones can carry out circuit simulation for multiple types of circuits. For example idealCircuits and QUCS; these software let you design and simulate both electrical and electronic circuits on your PC. You just have to add components from the component list that these circuit simulator freeware provide and run simulation. Go through the list and you will find out about the mentioned software in detail. I have described these software in such a way that you will find it easy to select what you actually need. In my opinion, almost all of the mentioned software are good choices, and what I will use will totally depend on my need. If I had to make a choice, I will go with idealCircuit. It has almost all the components required to design electrical and electronic circuits. If I had to design and simulate just electric circuits, I would go with Tina-Ti. You can also checkout the list of best free Oscilloscope Software and Signal Generator Software. 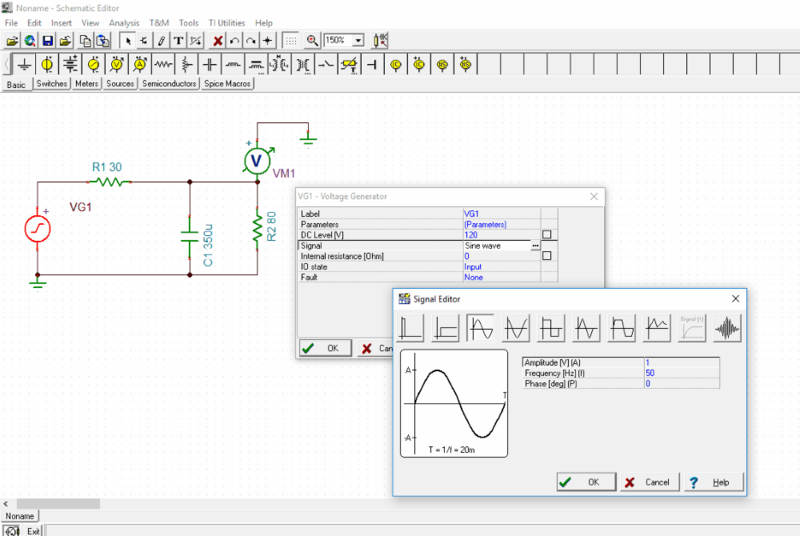 Tina-TI is a free circuit simulation software that can be used to design and simulate circuits. You can also check a circuit for errors before simulating it. Carry out DC analysis, AC analysis, Transient analysis, Fourier analysis, Noise analysis, etc. after designing a circuit. Tina-TI is an Electrical circuit simulator and lets you simulate Spice circuits as well. Here, you are going to find almost all components required to design a circuit. Also, you can change component values according to your choice. For example, if you take a voltage source, you can customize its voltage level, voltage waveform, etc. You will not only find basic electrical and electronic components, but advanced ones as well. Basic components available here are Voltage source, Battery, Voltmeter, Ammeter, Resistor, Capacitor, Inductor, Transformer, Switch, Jumper, etc. Advanced devices include Relays, Meters, Data Generators, Semiconductors (Op-Amp, Diodes, and Transistors), and Spice Macros (Amps, Comparator, SMPS, Converters,Buffer, etc.). Talking about circuit design and circuit simulation, this software lets you do it with ease. The component list is handy and placed on top of the circuit board. This makes it easy for users to design a circuit. Also, to change component values, a double click on it is all it takes. Run an Electric Rules Check from the Analysis menu to know if there’s any error in the designed circuit. So, if there’s something wrong, you’ll get to know beforehand. For the circuit I designed (above picture), I was suggested to add Ground connection to voltmeter and voltage source. To simulate a circuit, go to the Analysis menu and carry out the type of simulation and analysis you want to. I have already mentioned the analysis options available in the first paragraph. If you need to further analyze a circuit and its output, then you can make use of Multimeter, Oscilloscope, XY recorder, and Signal Analyzer. A designed circuit can be saved on your PC as schematics file or you can export it as an image, XML, or Netlist. It is one of the best circuit simulation software out there and highly recommended. idealCircuit is an amazing circuit simulation software. It lets you carryout electrical circuit simulation as well as electronic circuit simulation. Most of the software listed here provide either of the simulation options, so this can be your pick if you need both electronic and electric circuit simulator software. Another impressive feature about this software is that, there are 3 tabs available here for circuit design, simulate and view resultant waveform, and to view AC parameters of the simulated circuit. Probes: Voltmeter, Ammeter, and AC source. RCL: Resistor, Capacitor, Inductor, and Coupled inductor. Diodes: Diode, Zener, Bidirectional Zener, and Bridge rectifier. Transistors: NPN, PNP, N-FET, and P-FET. Amplifiers: Buffer, Comparator, Differential amp, Differential comparator, and Summing amp. Sources: Voltage sources and Current sources. Switches: Normat switch, Logic/Current/Voltage controlled switch, SPDT switches, etc. Transformers: Winding or Transformer set. Logical: Logical gates like AND, OR, NOR. XOR, etc., Flipflops, Trigger generator, Schmitt trigger, etc. After designing a circuit, simply go to the Transient tab and click on the Start Transient option to view the simulated waveform. The AC tab displays the output AC parameters of the circuit. To see how to simulate circuit using this freeware, you can load the pre-loaded designs available and simulate them. CircuitMod is another free electric circuit simulation software that lets you easily design and simulate circuits. It provides a minimalist and real time environment for circuit simulation. As you add components and create circuit, the output values and waveform are displayed in real time. Circuit designing is easy to carry out here. The component list is not available on the interface, and can be accessed via context menu by right clicking on the circuit board. Here, you will find options to add Wire, Resistor, Capacitor, Ground, Input/Output devices, Passive components (inductor, switch, transformer, potentiometer, etc. ), Active components (diodes, transistors, amplifiers, FETs, etc. ), Logic gates, Chips, Display devices, and more. So, this not only lets you design electric circuits, but you can also use it as an electronic circuit simulator. As the simulation goes on in real time, you can vary the simulation speed and current speed to view waveform accordingly. The voltage across a component is displayed right besides the waveform. Simply hover mouse cursor on a component to view respective values. You can save your circuit in CMF format to view or modify it later. For your ease, various circuit designs have been pre-loaded here, such as: LCR, Voltage divider, Filter circuits, Op-Amp circuits, Timer circuits, Transmission line circuits, and much more. CircuitMod is an amazing circuit simulator software and can be very useful when used for study purposes, as it has pre-loaded circuits. Logic Gate Simulator is an open source circuit simulation software. It lets you design logic circuits, simulate them, and view output on oscilloscope. You can either load a .gcg format circuit or design one from scratch. For logic circuit design, various components are available. The interface is arranged in a very good manner, making it easy for you to design a circuit. You will find lists of Basic gates, Compound gates, and Input/Output gates. You can also create custom IC by joining a group of components and save it to use later. A design can be saved in .gcg format, or you can export you design as image. You can also take a printout of your design. Logic Gate Simulator is exclusively designed to create and simulate logic circuits. CEDAR Logic Simulator is another opensource circuit design software and circuit simulation software. You can use it to design and simulate simple as well as complex logical circuits. The output waveform of simulated circuits can be viewed on the integrated oscilloscope. You can choose from a good list of electronic and logical components to design circuits. In the list of components, you will find basic logical gates, input and output devices, MUX and decoders, flip flops, registers, RAMs and ROMs, and chips. One of the best thing about this electronic circuit simulator is that, you can design multiple circuits here in different tabs. You can load or save a circuit file on its workspace. It supports .cdl format. Digital Logic Design is another simple logic circuit simulator. Its is an opensource circuit simulation software for Windows, Mac, and Linux. It lets you design and simulate logical circuits with the list of logical components on board. The components that you will find here are basic logic gates, derived logic gates, flip flops, input/output parts, etc. Few more component are available that you can add to a circuit, such as: adder, subtractor, comparator, converter, encoder, decoder, Mux/DeMux, counter, register, memory, ALU, etc. A probe and an oscilloscope are also available to analyze output after simulation. It is another simple and easy to use electronic circuit simulator software. Logisim is an opensource and java based circuit simulation software. It is multi-platform and can be used on Windows, Mac, and Linux. I works just like the logic circuit simulator software mentioned above. Add the components to the circuit board to form a circuit, then simulate and examine it. The list of components are available on the right side of the interface. Here you will find the following components: logic gates, parity gates, buffer, plexers, ALUs, flip flops, register, counter, LEDs, 7 segment display, and much more. For few components, you can change their parameters as well. Like, for flip flops, you can select the trigger edge type. Real time simulation is provided here. Output can be analyzed by applying scopes, like: Oscilloscope and Probes to the circuit. QUCS or Quite Universal Circuit Simulator, as the name says, can simulate almost any type of circuit. It is an open source circuit simulator. Either you design an electrical circuit, or an electronic circuit, this software has components for both. Be it resistor, capacitor, voltage source, current source, probes, transmission lines, transistors, amplifiers, diodes, comparater, flip flops, or simulators, you will find it all here. Design a circuit and simulate it. If there’s any error, it shows up. If there’s no error, the circuit is simulated and circuit parameters are displayed. QUCS is a very good alternative to the above mentioned software, such as: TINA-Ti, idealCircuit, etc. MultiMedia Logic can be another good option to design and simulate logical circuits. A large list of components will help you design extensive circuits. And, with the help of scope tools, you can analyze simulated circuit’s output. The components to design circuit are available in a floating Tool Bar, and some extra components are available in the Draw menu. The components include Logic gates, Flip flops, Counters, ALUs, MUX, LEDs, Switches, and more. You can even attach the in-built oscilloscope to the designed circuit to view output waveform after simulation. There’s nothing different in this logic circuit simulator as compared to above mentioned software, except a bit different layout. Logical Circuit is another opensource logical circuit simulation software that you may like. Like others, it lets you design and simulate circuit. But, what I liked about this software is that it lets you add parameters to components before adding to the circuit design board. While we are talking about components, let me inform you, that there are pretty basic but ample logical components available here. To name a few, you’ll find logical gates, input devices, output devices, sensor, clock, LED, 7 segment display, LED matrix, buzzer, probe, etc. To simulate a circuit, simply press the Power button. An option lets you view the truth table of the designed circuit. Oscilloscope can also added to view output waveform. A circuit can be saved as CircuitProject file to customize or view later. PECS is a free Power Electronics Circuit Simulator software. It can be used to simulate power electronics circuits with electrical and electronic components. A wide list of components are available in this circuit simulation tool. After designing circuit, you can not only simulate it, but can view output waveform. If you have a circuit saved on your computer in .ckt format, then you can open and simulate it here. Various types of voltage sources: VDC, VAC, IDC, VCVS, VCIS, ICIS, etc. Basic circuit elements: R, L, C, Transformer, Wire, Ground, etc. Switch Control elements: Clock, Modulator, Upper limiter, Lower limiter, Threshold, and VCO. Other components: Switch, Diode, Op-Amp, and multiplier. It is another good option if you are looking for an electronic circuit simulator. Digital Works is an electronic circuit simulation software where you can design and simulate simple and complex logic circuits. The basic components such as logic gates, flip flops, Input/Output devices, and wiring tools are available on the interface. To add complex components, visit the Parts Center. In parts center, you will find the following components: ICs, Macros, Busbar, Registers, Tristate, DIN, etc. Simulate a circuit after it is designed. There are hotkeys defined for circuit simulation. You can even save a circuit in .dwm format to modify or simulate later. Deeds (Digital Circuit Simulator) is another advanced electronic circuit simulation software for Windows. Its almost like Digital Works, with all the components required for circuit design and circuit simulation. Along with basic logical and input/output components, there are various other components available, which are worth mentioning. These are: Decoders, Encoders, Multiplexers, ALUs, Memory devices, Registers, Counters, DACs, Micro computers, Bus, etc. Simulate your circuit once designed, or test an already designed circuit. The simulation result shows on the output device of the circuit. Supported file format is .pbs. hades is a good option for circuit simulation if you have an already designed circuit in .hds format. There’s no doubt in the fact that you can design circuits here, but the designing process is not that user friendly. The list of components that you can add to design a circuit can only be found under the context menu (right click menu). While some people might be okay with it, but most of you will not find it a handy solution to design circuits. Talking about the components, there are basic as well as advanced logic components available here. The components that are available here are: input/output components, logic gates, complex logic gates, flipflops, registers, MUX, RAM, triggers, 16C84 microcontroller, etc. After simulation of circuit, add probes to view values of voltage and current across devices. It also lets you view the waveform of simulated circuit. PSU Designer II is a free electric power supply unit simulator software. It lets you design simple linear mains power supply that is found in tube amplifiers. For circuit design, you can select the type of source, type of filter, and the type of load. Source type available are: Solid state and Vacuum state. Under these two types of sources, you can select from the following subcategories: half wave, full wave, bridge, or voltage doubler. Filter can be selected from C, RC, LC, or Current tap. Load types available are Resistive and Constant current. Various parameters can be set before circuit simulation. Select accuracy level, set base frequency, set rectifier leak, and set simulation time. Once you simulate the designed circuit, values of current and voltage across the components of the circuit are displayed. Select a result to view its plot on the graph, which is available right on the interface. It is one of a kind and exclusive electric circuit simulation software for Power Supply Units. Micro-Cap is another good circuit simulation software for Windows. It lets you design and simulate power electronics, electric, as well as logic circuits. With a very large collection of components, it is one of the best circuit simulation software. Before we proceed further, I would like to bring it to your notice that the free version of this software is an evaluation version, and comes with certain limitations. Checkout the limitations of evaluation version here. Despite of the limited features, it lets you design and simulate general circuits easily. Lets get to know about the list of components and simulation features briefly. As mentioned before, the list of components is very wide. The basic electrical components, such as Resistors, Capacitors, Inductors, along with Transformers, Diodes, etc. can be used. Other component types available are: passive components, active components, waveform sources, function sources, laplace sources, connectors, SMPS, modulators, IBIS, BJT, crystal, DC-DC converter, diodes, IGBT, MOSFET, sensors, thyristors, logical gates, flip flops, push-pull devices, LEDs, and much more. Connect relevant components to form a circuit, and then simulate the circuit from Analysis menu. In the Analysis menu, you will find options to simulate and view circuit Transient, do AC analysis, DC analysis, dynamic DC analysis, and dynamic AC analysis. There are various other functions available under the Analysis window, but they are locked for the evaluation version. Circuit Construction Kit is a simple but pretty interesting circuit simulator software for kids. It has been developed to teach the basic concept of electricity. In the component list, you will find a bulb, a resistor, wire, a battery, and a switch. You have to construct a circuit using these components. That’s all. You can use voltmeter and ammeter to measure voltage and current values across components. Note: This software only works if you have a working internet connection. Circuit Sandbox is another simple and free logic circuit simulation software. Build logic circuits with the help of components available, and simulate to view output. Very basic components are available here. You will find logic gates, flip flops, input and output devices, ground terminal, LEDs, etc. Run simulator after circuit design to see if output displays. You can also save a circuit design for future. jCircuits is a free logic circuit simulator with logic gates, flip flops, logic adders, bus source, MUX, DEMUX, and ALU logic gates. Create logic circuit to simulate it or use any of the pre-loaded designs to simulate. The output can viewed on the output device connected to the circuit. Log window keeps track of the activities going on while circuit design and simulation. jCircuits is another logic circuit design software with no special features to brag about. 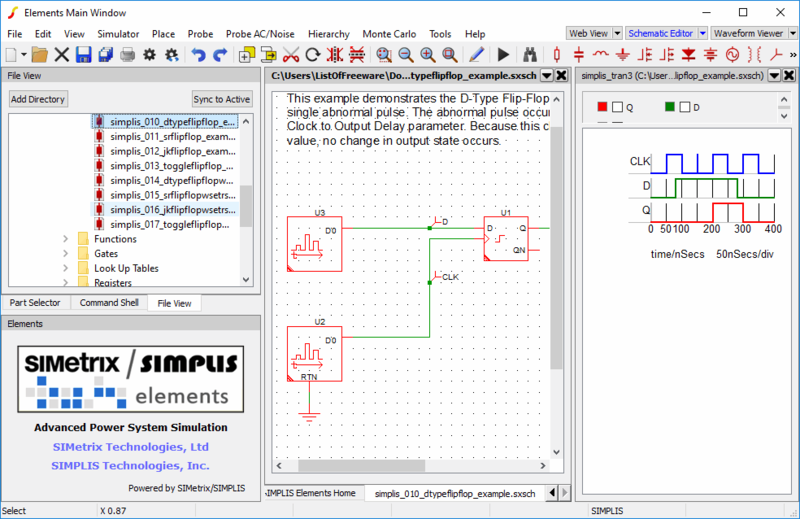 SIMetrix/SIMPLIS lets you design and simulate electrical as well as electronic circuits. Just like idealCircuit, you can simulate electric circuit, power electronic circuit, and logic circuit. A good list of components make this software worth a try. Circuit simulation not only provides values of voltage and current across components, but also provides transient waveform analysis. In the list of components, you will find active components, passive components, transformers, connectors, probes, voltage sources, current sources, semiconductors, logic gates, amplifiers, transistors, and more. The simulator menu has options to carry out analysis, run schematic, check if the circuit is complete, etc. You can also view transient waveform of the circuit once simulated. Its a complex, yet very extensive circuit simulation software with loads of tools, components, and analysis options. Proteus is a circuit simulation software that provides a demonstration version for free. The limitation of the student version is that you can design a circuit, simulate it, but the circuit cannot be saved. Moving on to the features of this software, you will find a good number and variety of electrical and electronic components. Some of the available components are: Analog ICs, Capacitors, CMOS 4000 series, Connectors, Data Converters, Debugging Tools, Diodes, ECL 10000 Series, Electromechanical inductors, Laplace Primitives, Mechanics, Memory ICs, Microprocessor ICs, Operational Amplifiers, etc. Place them on the circuit board to create a circuit, and then go to the Debug menu to simulate it. Full analysis of circuit is displayed on the interface after debugging. There’s no doubt that it is a feature rich circuit simulation software, but I did not find it as user-friendly as other such software, like Tina and idealCircuit. Solve Elec is a circuit simulator and solver software. It can not only simulate, but solve circuit for you. After circuit simulation, it lets you view circuit properties, circuit equations, and circuit graphs. You can view versus graphs between different circuit parameters, such as: E1 vs R1, E1 vs E2, R2 vs I1, and more. There are two modes for circuit design here: AC mode and DC mode. Design an AC circuit or a DC circuit. Components available are voltage sources, current sources, Resister, Capacitor, Inductor, Diode, LED, Measurement devices, etc. Save a circuit to load and simulate later in .eln format. This electric circuit simulator software is perfect for students. XSim is a dedicated electric circuit simulation software. Here you can design circuits by adding components such as Resistor, Inductor, Capacitor, Driver, Ground, Power source, etc. Its a very basic software and in the name of simulation, it provides frequency response graph and Impedance graph. That’s all. In addition, you are also allowed to add some text to the workscpace. This electric circuit simulator is best for very basic circuit design and simulation.